Monkees? Wasn't that a short special on Animal Planet? The show received two Emmys, the four lead actors popularity could only be mirrored by Beatlemania at the time, and today, no one can not think of the show without singing a bit from the theme song. The name of that 1960s situational comedy hit? "The Monkees" spawned many merchandise products, ranging from hangers to lunch boxes to wool hats. None of the Monkees received hefty royalties for this merchandise, except for the four pop albums that carried The Monkees name which were sold alongside the merchandise. However, the first two of the four albums did not feature Micky, Davy, Peter, or Mike playing an instrument or singing back-up vocals on the tracks (with the exception of Peter Tork who played fourth chair guitar on "Papa Gene's Blues", and Micky Dolenz, who sang back-up on "Sweet Young Thing", which were on their first self-titled album). 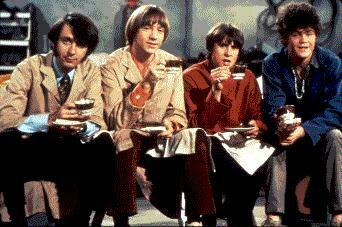 Two of the actors, Michael Nesmith and Peter Tork were experienced musicians. Even though initially the shooting schedule and publicity schedule (and recording vocals schedule) was tighter than Fort Knox, Nesmith thought all four should have a say on making the records. The man who initially did have the say was Don Kirshner, a music coordinator from the Northeast of the States. His list of producers and/or songwriters ranged from Carole King and Gerry Goffin to Neil Diamond. It was his connection with Neil Diamond that got the international hit "I'm a Believer" recorded. The producers of "The Monkees" started to support the lead actors after "I'm a Believer" was released. They insisted that The Monkees should be allowed on the next Monkee single, even if it's just the B- side. Kirshner did not relent to the orders. Kirshner released "A Little Bit Me, A Little Bit You" backed with the song, "She Hangs Out" exclusively in Canada, and then disappeared temporarily. This new record did not feature a monkee on an instrument or on backing vocals, and had only Davy Jones on lead vocal. After that incident Kirshner was booted out, and four lead actors were given the okay to record the way they want to record. Making an album with twelve tracks is an extensive process that The Monkees' schedule could not compensate for. The reins were given to Chip Douglas, who did an arrangement for and played with The Turtles. The first recording to be released with Chip Douglas was "A Little Bit Me, A Little Bit You", this time backed with the Nesmith penned tune "The Girl I Knew Somewhere". All four Monkees participated in the song as performers. This record climaxed to the #2 position on the American charts in 1967, only to be outdone by The Beatles' chart-topping "Penny Lane". The rest, as they say, is Billboard history. What does this site have to do with The Monkees? Monkee TeleVision is dedicated to bring you direct Monkee related abstracts that were on television. The chemistry that was there between the lead actors at times was very good, and even off the series the chemistry was still good. Since the Monkee episodes from the hit 1960s series was got me started liking The Monkees, it's the meat and potatoes of what you will find here. I intend to add more recent television abstracts, like from the Michael Nesmith directed, 1997 special, "Hey, Hey It's The Monkees" and the appearance of Micky Dolenz, Davy Jones, and Peter Tork in "Rave On" (an episode of the sitcom "Boy Meets World"). Prepare to enter the realm of Monkee TeleVision! Low Bandwidth - mainly text with minimal pictures. Check out our newest section dedicated to Episode #451! The Monkees and The Monkees guitar logo are ® and © Rhino Records. Monkee TeleVision is not associated or endorsed by Rhino. This is a fan's site revealing abstracts of The Monkees.